When I was a kid, like most boys, I had a fascination with guns. Not an obsession. Not an all-consuming passion. But certainly an interest. The fact is, even today, you’ll be hard-pressed to find a boy who never picks up a stick and pretends it’s a gun, or who never points straight out with his forefinger, lifts his thumb to the sky and then closes it. Let’s not get into the sociological and psychological causative factors behind this phenomenon right now, because those are big words and I don’t really care. It’s just a fact: Boys like guns. Girls like them too these days, because we teach our young women-to-be to be every bit as assertive as our future men. Even when they’re wearing pink shorts. That’s a good thing. That’s how it is. Don’t like it? Shoot me. Anyway, the point is . . . I get it. Kids like guns. I still remember my delight when I was all of 4 years old and my mom and dad bought me a Davy Crockett faux-leather frilled jacket and a Davy Crockett coonskin cap and a Davy Crockett RIFLE (!!!) as my reward for not biting the dentist and kicking him in the groin for good measure after the sumbitch pulled out one of my teeth. (He had it coming.) I think my parents’ purchases alone may have earned Fess Parker a second season. But I digress. This is about guns. I saw all sorts of guns on television, and I saw guns holstered at the hips of policemen on the street, and I knew my dad had carried one in World War II, and I wanted one. At the very least, I wanted to shoot one. So I was thrilled to get the chance five years later, when I was 9, and my parents shipped me off to sleepaway camp for the summer. It was a progressive place that offered all sorts of activities – swimming and baseball and tennis and boating and camping and arts & crafts and archery and riflery. Yeah, RIFLERY!!! That sure as hell beat arts & crafts. Go ahead, make yourself a lanyard. I’m gonna shoot something. So once a week or thereabouts, a group of us would head out to the rifle range, where a counselor would teach us all about gun safety and how to hold the rifle and exactly what to do if we wanted to pierce the center of a target with a .22-caliber bullet. So I know what it is to be 9 years old and want to shoot a gun. I know the attraction. I know the excitement. But for the life of me, I can’t understand what sort of mind thinks it’s a good idea to put a semi-automatic Uzi in the hands of a 9-year-old at a place called the Arizona Last Stop shooting range, the highlight of a tourist adventure known as Burgers and Bullets, because I guess the fries just don’t satisfy there. Our guests have the opportunity to fire a wide range of fully automatic machine guns and specialty weapons. You will choose the guns which you want to shoot from our extensive collection and we provide the eye/ear protection, ammunition, and expert guidance. Our guests have an opportunity to choose from a wide variety of machine guns. Click here to view all of our available guns. Our 50 Cal. selections includes the Barrett Sniper Rifle, the Browning BMG .50 Cal (‘the deuce’), and the Desert Eagle. We even have the actual firearms used in several Hollywood hits including The Terminator and Rambo II. To top it off, lunch is included inside the the World Famous Arizona Last Stop restaurant located onsite. You will be treated with the World Famous All American Hamburger, fresh cut french fries, and a drink. 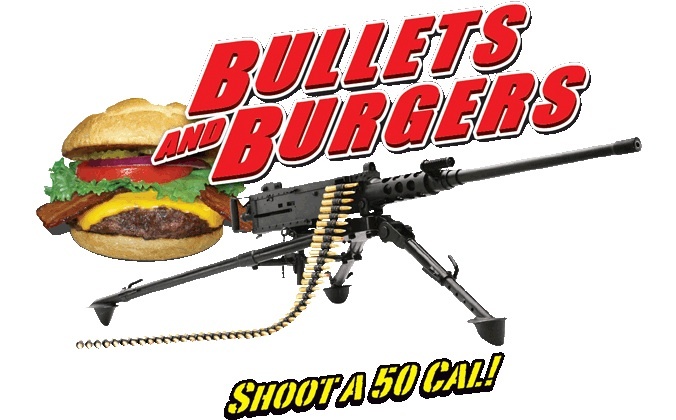 The All American Burger is guaranteed to be the best hamburger you have ever eaten.The Bullets and Burgers Adventure is approximately 4 – 5.5 hours in length from scheduled pickup to drop-off back at your hotel. Helicopter upgrades are available. Please see our Helicopter Adventure Page. On Monday, a 9-year-old New Jersey girl, dressed to kill in her pink shorts, had the thrill of a lifetime when she was given a chance to shoot an Uzi at the very appropriately named Last Stop shooting range. She made the most of the opportunity. Her parents caught it all on video. Maybe they’ll show it at her wedding someday. The kid got off one good shot, and then her instructor put the weapon on “full auto.” The kid fired again, but she couldn’t handle the recoil. The gun lurched upward and she shot the instructor in the head, killing him. I’m sure it’s a thrill she’ll remember for the rest of her life. Her parents, too. And the family of 39-year-old Charles Vacca, the man the girl killed because she she was too little to handle the weapon he put in her hands. And I’m sure the Last Stop and Bullets and Burgers will remain in business, because … well … because accidents just can’t be avoided, you know? This entry was posted in In the News, Uncategorized and tagged Bullets and Burgers, guns, Last Stop, shooting range, Uzi by stephenbromberg. Bookmark the permalink.